No dollhouse is complete without a well-stocked larder and the best place to shop for all your favourite delicacies is The Mouse Market. The designer behind The Mouse Market is a pastry chef, a graphic designer and a miniatures enthusiast. These interests combine to make tiny little chicken pot pies, pancetta wrapped pork loin, roasted Cornish hens and lemongrass garlic poached cod, to name just a few dishes. The detail is incredible and the menu enticing. Miniatures are organised into categories so that you can find exactly what you fancy – I like the buffet selection which includes little bowls of olives, cocktail onions and gherkins, baked goats cheese with pecans and an array of scrumptious cheese boards. Make sure you leave room for dessert! There’s poached pears, blood orange glazed cheesecake, macaroons, cupcakes, cherry pie and more. All the food is made at 1/12 scale and prices begin at US$5. 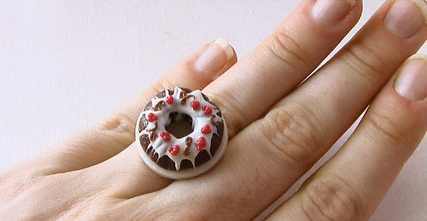 While you are browsing, be sure to take a look at the section featuring earrings and rings – I know I don’t need a chocolate bundt cake ring but it just looks like so much fun. Mouse Market ships internationally. 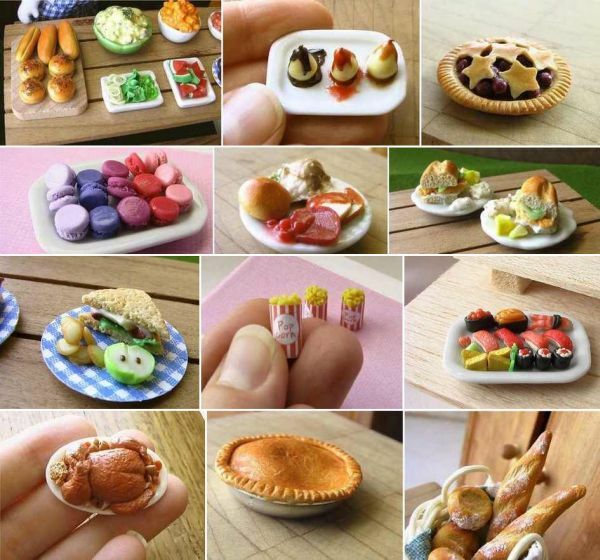 If you are still hungry, check out our previous post on tiny food for Barbie.